One minute Harry was there, the next he was gone. Without any warning Harry had decided to go mountaineering. It seems that Number 58 is now home to a Young Upwardly mobile Pup. Harry set off eagerly on his climb towards the top of the world, quite beside himself with excitement at the prospect of all the delights he might find when he got there. Eight or nine steps up and his bravery started to fade, he took a quick look over his shoulder just to check that reinforcements had arrived. Hmmm. Maybe all those exciting things up there can wait for another day. Oops. Stuck. 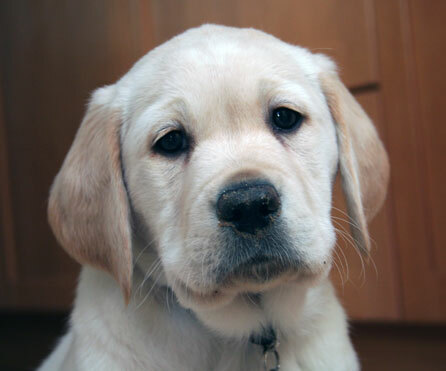 Maybe being a brave and inquisitive little pup isn’t all it’s cracked up to be. Looks like we’ll be getting the stair-gate out of the attic a little earlier than planned. Friday night and a trip to the local pub was in order. After Harry had charmed all the locals, he decided that going to the pub was no big deal, so he did what he does best, and fell asleep under the table. Harry’s good pal Goldie came to stay for a while today. Harry followed her around like a shadow the whole time and everything she did, he had to do too. If she had a drink then he had a drink, if she lay down then so did he, if she sat in the garden then he had to sit in the garden. 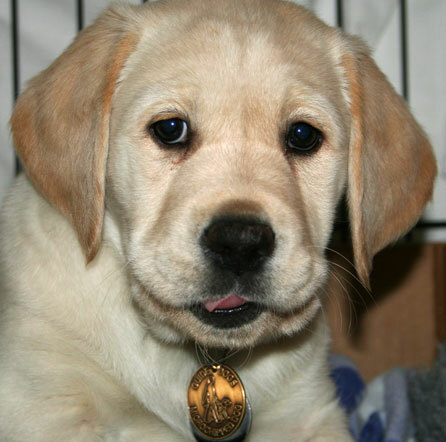 In fact when he grows up he’ll probably want to change his name to Goldie. Today Harry turned 10 weeks old. Harry’s weight has risen to 9.6 kg, his tail still measures 8½ inches (22 cm) and hasn’t grown, although his legs and body most certainly have. It’s getting harder and harder to carry him around everywhere, he feels so heavy. Harry has definitely now got the hang of sleeping through the night and has given up on the 6am starts – now he doesn’t wake until around 7.15am, much to our relief. Harry’s response to ‘come’, ‘sit’ and ‘give’ has been so good we’ve introduced the ‘down’ command this week. He’s starting to get the hang of it, bit it still needs work. Toilet training continues to improve, but travelling in the car can sometimes be one of the noisiest experiences known to man. One day he doesn’t make a squeak and we think he’s cracked it, and then the next it’s like having a howling banshee in the car. Harry attended another Pilates class where he had a go at climbing his first flight of stairs. He managed three steps before deciding that maybe it wasn’t safe and please could he be carried? 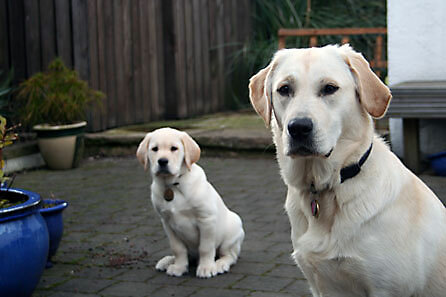 Another new experience this week was coming face to face with two cats at the home of another Puppy Walker. They stared at each other for a while and Harry was most put out when they stalked off, tails held high, in disgust. He didn’t even get a chance to ask them if they wanted to play. 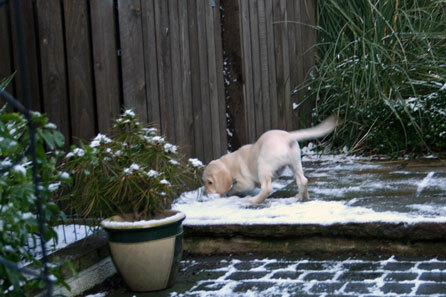 But if Harry had to choose the best bit from his adventures over the last week it would be the snow. Definitely the snow. Harry had lots of fun over the Easter weekend but he also did a little bit of work too. 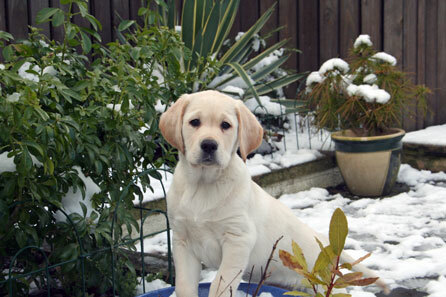 Guide Dogs were fund-raising at a local railway station and we went along for a short time to support them. 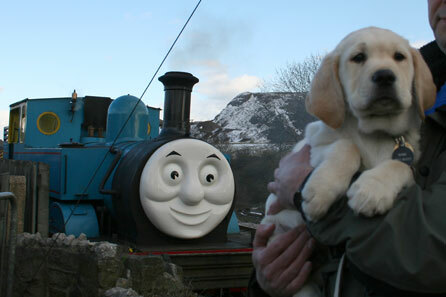 This time Harry wasn’t the star attraction – Thomas the Tank Engine was. Harry did get to see Thomas but he wasn’t that interested. He didn’t have a tail. And he didn’t want to play. 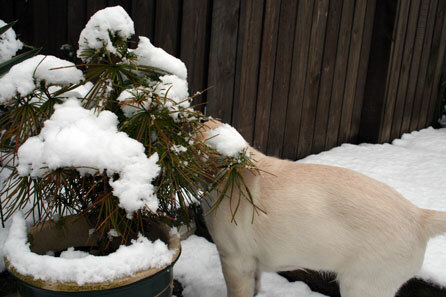 On Saturday we had a light covering of snow which completely confused Harry. 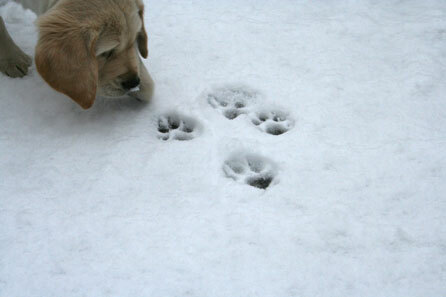 First one paw went out the back door, then another and then he quickly reversed. Eventually curiosity got the better of him. What was this stuff? It most definitely had to be tracked down to see where it had come from. Then it had to be pushed around, sniffed and tasted, and hey just a minute! It might want to play! 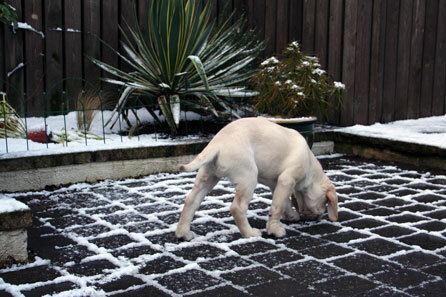 Sunday came and we had more of the white stuff so Harry put his new tracking skills to good use. Aha! I think it came from behind here. 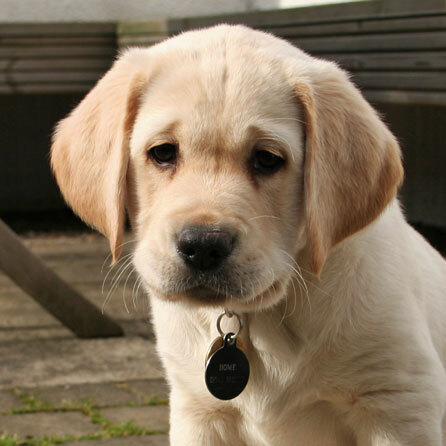 Sometimes a Guide Dog pup has do nothing, absolutely nothing, and learn to just sit quietly. But it’s hard. So hard. Really hard. There hasn’t been much sun recently, but this afternoon, for a period of about 5 minutes, we had glorious sunshine streaming through our windows. And guess who grabbed the best seat in the house? Earlier in the day Harry figured out that if he stood on his back legs, with his front paws on the windowsill, he could see OUTSIDE! And outside is exciting. 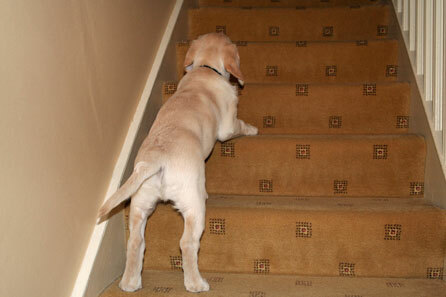 There are all sorts of things that a Guide Dog Puppy in Training needs to know about. Birds, people, traffic and the cat from next door, all are worth a look, especially the big farm tractors that come crashing down the road, over the speed bumps, making the glass in the windows rattle. They are really exciting and need a woof. Except the woof still isn’t really a proper woof, its more like a little ‘werf’. Still, he thinks it’s worth a try – the tractor might want to play. Today Harry turned 9 weeks old. The last week has been another week of changes. Suddenly, on his eighth night at Number 58, Harry got the hang of going to bed. As a result we are no longer walking around like zombies and suffering from a lack of sleep. The bags under our eyes have gone from suitcase size to handbag size, nothing a bit of concealer can’t cope with. We dropped into the vet’s again to see how heavy he’s got and were amazed to discover he’s now 8.4 kg. That’s an increase of 1.3 kg in a week! Unbelievable. His tail now measures 8.5 inches (22 cm). 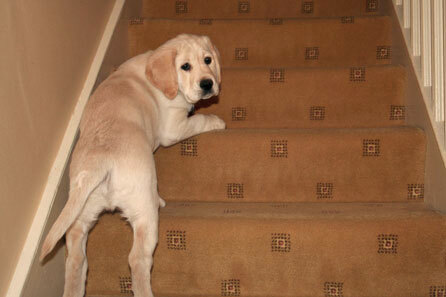 Harry has also grown in confidence over the last week. He’s figured out how doors work and that he has to step to one side when one is opened. He’s started to look up and be aware that there are all sorts of goodies on the kitchen benches, delights yet to be discovered, if only he could reach. Harry is doing really well with his obedience training. He understands and responds to the commands ‘come’, ‘sit’ and ‘give’. He is especially good with the ‘give’ command. It’s great that he gives up his toys and bone when asked, but when it’s a mouldy leaf or a worm he’s found in the garden, then sometimes asking him to ‘give’ doesn’t seem such a good idea. Toilet training is coming along nicely, he cries at the back door when he needs to make a deposit, which we’re very impressed with. He’s not so fastidious when it comes to puddles though, especially if it’s raining outside. Or windy. Or too cold. Or he’s just too darn tired to drag himself out. 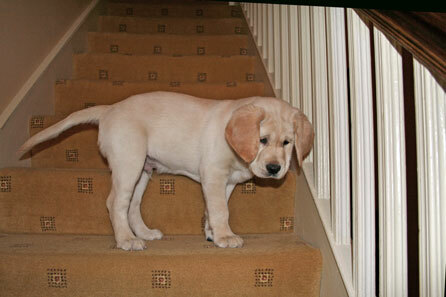 He’ll stand on the step, sniff the air and make a decision. Do I go out in THIS weather or should I just stand here and do it now? No amount of encouragement will get him out if it’s both windy and raining. Overall we currently stand at about 80/20 in our favour. Harry still objects loudly to travelling in the car. He’s fine when we’re stationery at the traffic lights, or the car is reversing, but when we’re going forward his vocal objections can be heard 3 miles away. 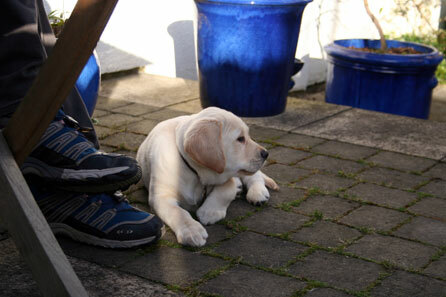 So today his very good pal Goldie (also a Guide Dog Puppy in Training) came for a ride with him in the car. 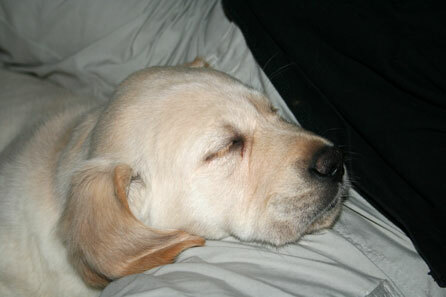 Goldie is older by about six months and much more ‘grown up’. She showed him how to behave in the car and that all the howls, screeches and squeaks were totally unnecessary. As a reward they got to go to Costa Coffee where the humans had a welcome caffeine injection, and the pups had a snooze. We’re hoping that Harry has learnt from Goldie and from now on there will be peace in the car. We’re not going to put a bet on it though. Today we paid a visit to our local supermarket. 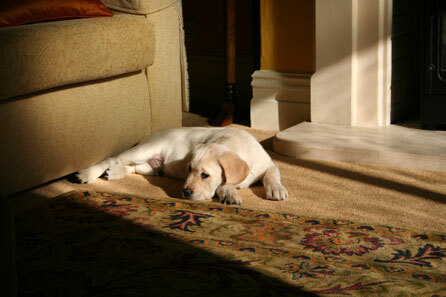 Halfway down the first aisle and we heard the first shriek… ‘Look mum, it’s the Andrex Puppy Dog’. 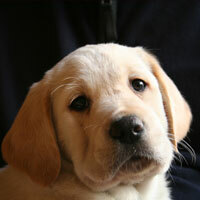 Adoring crowds gathered round and Harry sat beautifully, turning on his big puppy dog eyes. Nothing like a crowd to make him turn up his level of cuteness. The staff made us promise to visit at least once a week so they can watch him grow up and Harry added another 25 members to his fan club. Soon he’ll have the paparazzi following him around. 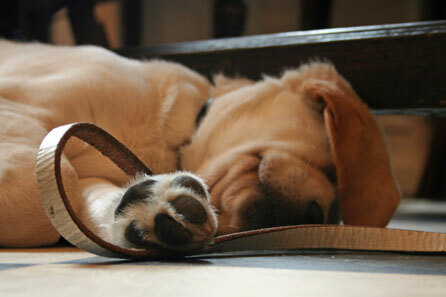 Being a celebrity can be hard work though, so its time for another nap.